Pedha Modak , ready in 3 ,2,1….. and here they come !!!!! 5 ingredient , 5 minute Pedha Modak recipe for Ganesh Chaturthi ! Makes about 71 Pedha Modak with the mold that makes 5 at a time! Can you believe the mixture for these Pedha modak is microwaved for just 3+2+1 minutes? Pedha is an Indian fudge like sweet which conjures up images of all things auspicious. They are offered to the Gods during festivals and other happy occasions ( one example being victories over tough exams:) and then shared with friends and family. Modak, with its distinct and exquisite shape is said to be Lord Ganesha’s favorite. So today, on the auspicious occasion of Ganesh Chaturthi, this is a special post for Pedha Modak! Traditionally Pedhas are made from khoa or khava, which is milk that is boiled and stirred and stirred until it is reduced to a coagulated solid. Simply said it is a labor intensive and time consuming process. This super easy, goof proof recipe is a dream come true for people like me who like quick and easy recipes without compromising the taste. I have made these Pedha Modaks for many years now and the only time I goofed up was when I tried to cook them a tad too long:) They were still fine but had a chewier taste. So if you have to adjust the cooking time according to your microwave, do so in small, 15 second or so, increments, and be sure to stir in between. The timings given here should work for most microwave ovens. In a microwave safe bowl, combine all the above ingredients, mix and microwave on high for 3 minutes. Stir well and microwave again for 2 minutes. You will see the mixture bubbling. Stir well again and microwave once again for 1 minute. Remove from microwave, stir well and set aside until the mixture is cool enough to handle. Pedhas can be also shaped into balls and stamped with a pretty stamp. 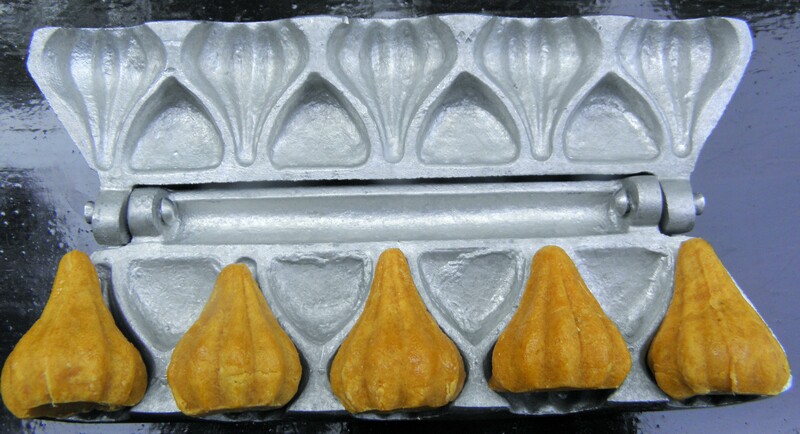 I used the molds shown below to shape them into Modak. This mixture is very forgiving, if you have to come back later and shape the Pedha Modak too. Just cover it loosely and set aside. Individual microwaves vary so please adjust timings according to your microwave.My timings are based on my 110V, 1000 Watts microwave. I am going to try making pedhas this week. Great receipe! Thank you! Oh my, love pedas, but not sure what Modak is? A great quick microwave version for folks on the run, love the shape. I can’t imagine all the different moulds that are available in the kitchen stores these days, it’s amazing! I wish they had the donut one when my girls were growing up. Loretta, this easy recipe makes authentic tasting pedhas. 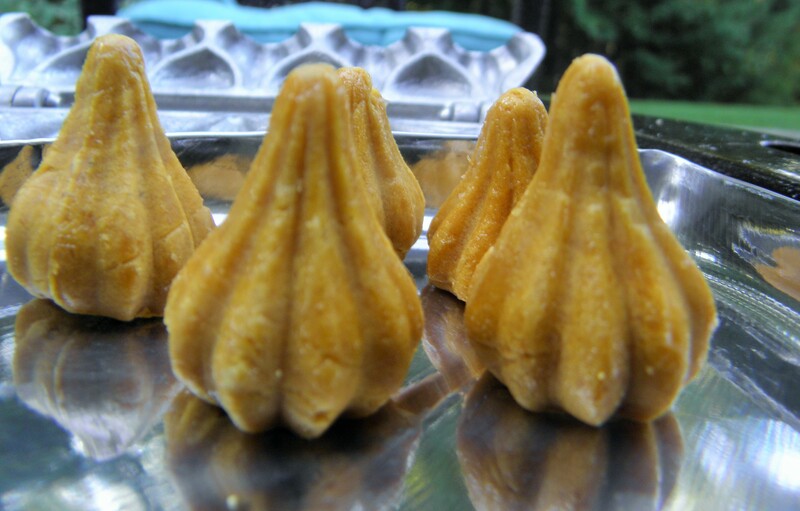 Modak is a sweet made for Lord Ganesha, which is the shape of the molds. Modaks are traditionally also made like sweet dumplings in the same shape with a rice flour cover and sweet coconut jaggery center. Awesome yummy Pedas!! Love the moulds too. I have never try it before but the recipe looks very easy – next time I will make it and let you know – bookmark it for the time being 🙂 thank you! I got it in Tulsibaug, Pune.They are really good and it helps that I can make 5 at a time! Ooh I have never heard of these, but they sound delicious! Love the mold, very cute! Thanks Swapna. It is a very quick and easy recipe too. Really lovely looking Pedhas and easy to follow recipe 🙂 Need to get those molds too. Thank you so much Madiha! Thank you so much! wishing you a Happy Ganesh Chaturthi too! These are so cute – I need this pan! I am not sure what went wrong with your cooking. Is the mixture not coming together or is it overcooked? If you let me know he details, I could help you. One stick butter? How much quantities?? Sorry for the delay, Meenakshi. One stick of butter is 8 tablespoons of butter. Thanks so much for your kind words. Modak is the shape but these pedhas taste awesome in any shape! And the recipe is super easy. Do let me know when you try them. Happy and Blessed Ganesha Chaturthi. I’m from UK, so what do you mean by one stick of butter??? Please could you leave the quantity in grams or ounces would be great!!! Anyways lovely idea for quick delicacies!!! 1 stick of butter in US is 8 tablespoons of butter or 4 ounces. This recipe is quick yet tastes authentic. Do let me know how you like it.